The study of the ancient Near East is inextricably linked with political developments in the modern Middle East. The past ten years have been a disruptive and difficult decade. CWA’s first issue appeared a few months after the US/UK-led invasion of Iraq, with the notorious looting of the Iraq Museum in Baghdad and the rampant destruction of multiple archaeological sites across the country. More recently, the Arab Spring in North Africa and into Syria has either terminated or seriously disrupted archaeological projects in this region, while laying open to destruction much of the cultural heritage of affected countries. Multinational, long-term research projects at world-famous sites such as Qatna (CWA 15) and Ebla have shuddered to a halt, and will likely remain closed for years to come. In Iran, the worsening of diplomatic relations with the UK has brought to an end a brief flourishing of collaborative field projects, while stricter heritage regulations in Turkey have had an impact on the development of new projects there. 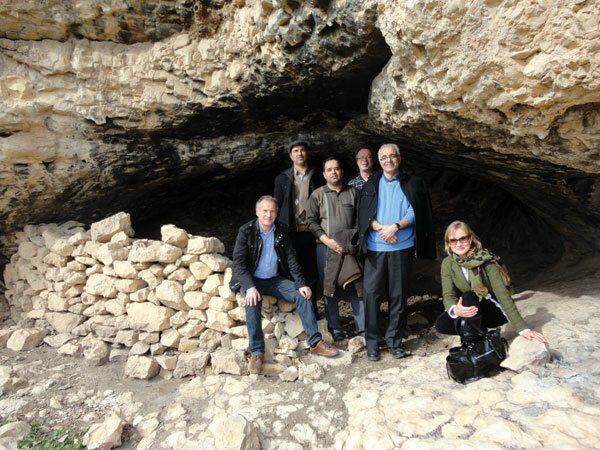 Roger Matthews (left) with colleagues at the cave site at Zarzi, Iraq. In the midst of these difficulties, one region of the Middle East stands out: the Kurdistan Regional Government of Iraq has been welcoming to foreign archaeologists, and there are now multiple international projects at work there. My own Central Zagros Archaeological Project has relocated from the Iranian high Zagros around Kermanshah to the Iraqi low Zagros in the KRG region of Sulaimaniyah, thus giving the opportunity to study Early Neolithic developments along a great transect through the Zagros Mountains (www.czap.org).